Floor Lacrosse is an exciting and innovative game that is suitable for all ages including youngsters with a range of special needs. It can be used in competitive events, informal recreational settings or educational settings. In many ways Floor Lacrosse simulates lacrosse by playing it at floor level with the participants gaining possession by ‘capping’ the ball and then travelling and or passing it as part of a team effort. The use of 'position roles' in specific zones should produce a fast exciting invasion game in which the use of space and speed truly reflects the best traditions of the main game of lacrosse. adherence to the rules and player positions. The ball is played on the court surface for all of the time, except in the cases of the two defender sweepers with pop lacrosse sticks. The emphasis of the game, as with lacrosse, is to move the ball quickly when in possession and to pass to a free team member. When not in possession receive the ball unmarked as an unmarked player. The game is best developed by encouraging open running play rather than the contest resting on the outcome of one to one marking. 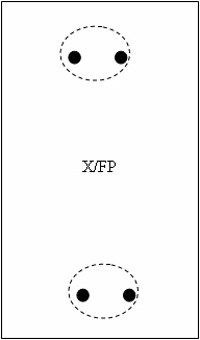 Whilst Floor Lacrosse can be played using a number of variations according to the needs of the participants and/or context of the situation, the following approaches have been found to be the most appropriate. Competitions: This type utilises a full Basketball Court with the usual markings for a six v's six game. See playing area. Informal activities: Modified competitive format or open play or open goal types. See diagrams below. There are eight in a squad, six/five/four on the pitch (according to the rules or the version being played). Teams can be of single or mixed gender and inclusive with individuals with special needs in matched ability pairs in specific zones. For the competitive version see area of play diagram. The two opposing centre players must stay in the central circle A*. The pairs of opposing midfield players must stay in the area B*. The two opposing sweeper players must stay in the end areas C*. One an offensive and the other defensive sweeper*. See area of play diagram. 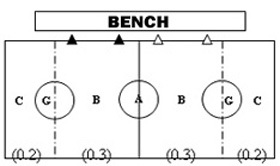 Players may only be changed from role/area via the substitution 'on the fly' (not whilst on court). No special protective equipment is required for goal keepers as the ball will rarely be lifted or projected at a dangerous speed. Rules also strictly control the use of sticks and physical contact in the field and goal areas to minimise potential dangerous play. They may only use the cap part of the stick to stop the ball within goal circle (however they must also not lie on the floor or place the stick horizontal to stop the ball). A four second time limit applies to clearing the ball. Field rules apply outside the goal circle. 'On the fly' providing that: There shall be only six sticks for the field players which must be exchanged as the players change over. Players must enter and exit the field of play via the 'gate' marked with two cones at the centre of the sidelines. Players not on the pitch must be at least 1m away from the side line and preferably seated on a team bench. For competitive play it is recommended that that the goals are approximately 1.8 to 2 meters wide (or any similar distance used in a commercially produced mini goal sets) and, approximately 0.75 to 1 metres high. For recreational play any safe markers can be used (bins, cones etc). Sportime Cap Ball sticks-plastic. Contemporary Pop Lacrosse sticks (plastic). See resources page. For competition, a firm plastic airflow ball (Cosom Safe Play) 2.75" / 7cm diameter. For recreational use any similar size low bounce airflow ball is suitable. Ideally a full basketball court with the usual markings. The surface must be relatively hard and smooth, whether indoor or outdoor. A goal line sweeper line each end (G) (_ . _) See starting alignment and positions diagram below. Indoors: the ball rebounds whenever possible. All play is started and stopped by the sound of the referee's whistle. The duration of the game shall be two halves of 15 minutes with an interval (half-time) of not more than five minutes. A goal is scored by swinging the ‘capped ball’ with the stick along the floor so the ball is released and propelled over the goal line. ‘Own goals’ can be scored. Goals may only be scored from the attacking half of the pitch. Dangerous shooting (i.e. lifting a swinging stick) will be penalized. Only goalkeepers (when used) are permitted in the goal circle. No other player may enter or reach in with the stick. Goalkeepers may not reach outside the circle to cap the ball. No intentional stick contact when endeavouring to cap the ball. No blocking a player's line of run when they are travelling with the ball. No dangerous follow through with stick (after shooting or passing). No intentional striking of the ball with the outside of the cap. Maximum of four seconds possession of the ball by a player (which cannot be extended by rolling the ball to oneself). Offside play outside or across the lines of the designated areas by the respective centres, midfielders, sweepers, goalkeepers. Aerial ball lifting - other than the defensive sweepers. Aerial balls (by the defensive sweepers) which cross the halfway line on the full. Goalkeeper playing the ball out of the circle or offside themselves. Goalkeeper committing a field foul. No field players may shield the goal circle within two metres to create another defender in addition to the goalkeeper - double defending. Free pass awarded to the nearest or infringed opponent. The offender is placed 2 meters behind player, all other players are placed 2 meters away. For simultaneous fouls alternate free passes are awarded through out the game (no dropped ball). For serious transgressions of the rules a five minute time out will be given to a player. No substitute can be made for this player during this time. For dangerous offensive play near the circle - a goalkeeper pass back into play. For double defending fouls or goalkeeper field fouls - penalty awarded. For goalkeeper offside - penalty awarded. The penalty is taken from the edge of the circle. While the shot is taken the goalkeeper must remain 'stationary' on the goal line, not move whilst the shot is taken and stand with the Cap Stick directly in front of their feet which must be held together, i.e. they cannot move at all. When two players compete and run to cap the ball the closest has the claim of possession. The second must give ground. Neither player is allowed to make contact with the caps in the process or have body contact. During play, a player without the possession may delay the progress of a player with the ball by being at least 1 meter away and moving slowly backwards. This is not blocking - see foul rules. Any game situation needs to be managed to account for the wide variation in movement potential which groups of youngsters, with either physical or learning disabilities, often have. Thus some form of 'balancing' the contest between the respective teams needs to be considered. Because of the format of Floor Lacrosse, the actual structure of the game makes this quite easy. Therefore traditional sport for the disabled classification systems may not be required. Instead a form of 'match classification' can be used with opponents in the respective four roles (area A, B, C, G) being notionally 'ability paired' with the agreement of the two team managers or with the discretion of the teacher in a lesson. Also at agreed times, the pairs of participants can be rotated from one area to another to experience the demands of the different player roles. a) how well the player understands the objectives and rules of the game. b) the physical abilities they have to be involved in the game. This successful approach used in trials - 'match rankings' - involves each player in a team (N=8) being ranked according to their overall ability (in terms of both a and b, above) Number 1's have the most relative ability to number 8's with the least. The teacher, leader, coach or respective team managers can then simply agree on which areas of the pitch the ranked numbers will be paired or alternatively the following recommendations can be used. Substitutions should then be done with simultaneous matched pairs and with the other team subsequently alternating this initiative. 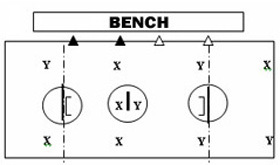 Even in competitive matches agreement between coaches could result in matched player being rotated from one zone to another at set times. When using this game approach the following playing areas and rankings format is recommended. Centres (centre circle, A) - Participants with the most limited understanding and/or movement co-ordination and/or hesitant disposition requiring some support. Rankings: 7, 8. Mid-Fielders (mid-area, B) - Participants who are the most athletic out of the group and can control the ball in dynamic situations: Rankings 1, 2, 3. Sweepers (offensive-defensive, end zone, C) - Participants whose relative ability is better than centres but who may need some guidance on attack and defence and are put off by the dynamic mid-field play. Rankings: 4, 5, 6. 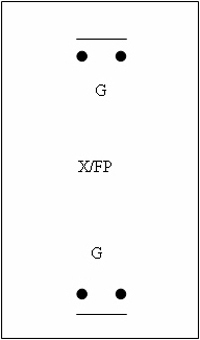 Goalies (goal circles, G) - Given that the higher the goal scores the more exciting the game will be, it is recommended that the goal keeper participant must not have the ability profile of mid-fielders. Rankings: 4, 5, 6. One umpire officiates from either of the sidelines. Throughout play the official's discretion may be used to award penalties for dangerous play or unacceptable behaviour (in addition to the penalties above). A player may be sent off as a last resort. The rules are there to protect players and make the game as continuous as possible. Unintentional fouls which do not give the offender or his/her team an advantage should result in a 'held' whistle whenever possible (official can call 'advantage'). Excessive use of the whistle is discouraged except to keep play safe and according the rules. As this is a dynamic game it is recommended that umpires carry out their officiating in a positive and friendly manner. Officials should use short, sharp, single blow of the whistle to both start and stop the game. A longer whistle indicates a goal. Clear, short explanation of fouls (e.g. stick contact on green, yellow ball) indicating with the arm, the team in possession to leave a second's time length before the call on possession. Goals: any suitable and safe goal device with the recommended measurements. Sticks: Capball sticks produced by Sportime, USA. Temporary boundaries markers: Spordas Flow Markers (throw down rubber markers). Twelve each of red, yellow, blue and green. Set of 48.Cat No. PPEH67864, SFBH67864, PTRH67864, PFBH67864, STRH67864 or SPEH67864. Ball: The most appropriate one for competitive play is the type currently used for the Unihoc kit, i.e. the harder airflow type - COSOM Safeplay Ball. For less formal situations the softer type of airflow ball or tennis ball would be appropriate. Davies X-Strap gloves allow participants to securely hold sticks. Cat No. (small/medium) PRDH84874 or SRDH84874. Cat No. (medium/large) PRDH84886 or SRDH84886. A small piece of tape can also be placed on the cap to show youngsters which way to point the cap so the best angle is achieved to keep it flat on the floor.